I love Reiner Knizia and I love Blue Orange so when I saw a prototype of this game back in February, I was super excited. I have been waiting (im)patiently to see the finished result and was rather happy to grab a copy at Essen Spiel! The board shows eights islands of the newly discovered archipelago, during the game you will be trying to explore as many of these islands as possible, claim resources and build your settlements strategically. The game is played over two distinct phases, scoring occurs at the end of each phase. Gameplay is very simple, however, there are many ways to score and it is easy to get blocked out so it is important to have a goal at the start of each round! Place a settler or village onto any space that is next to another of your pieces. If you place your piece on a space with a resource or statuette, take it from the board and place it in front of you. A village may not be played in the sea, only one piece can occupy any space and pieces placed onto spaces showing stone circles will be removed at the end of the phase. 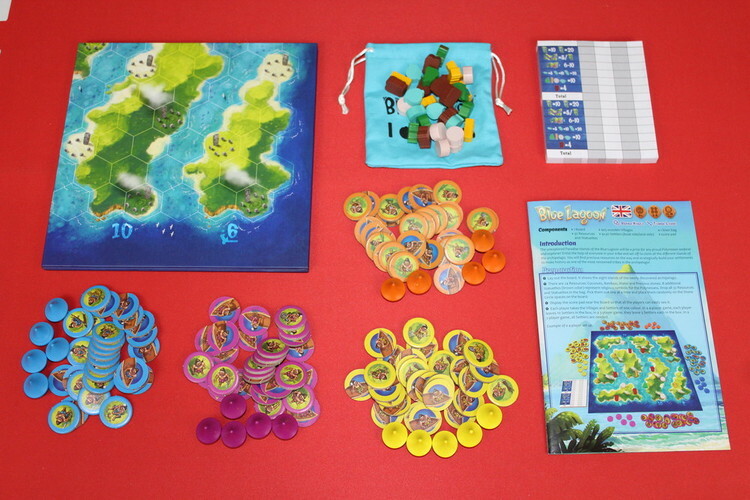 The Exploration phase ends either when all the resources have been collected from the board (not including statuettes) OR when all players have placed all of their pieces on the board. The first round of scoring then takes place. 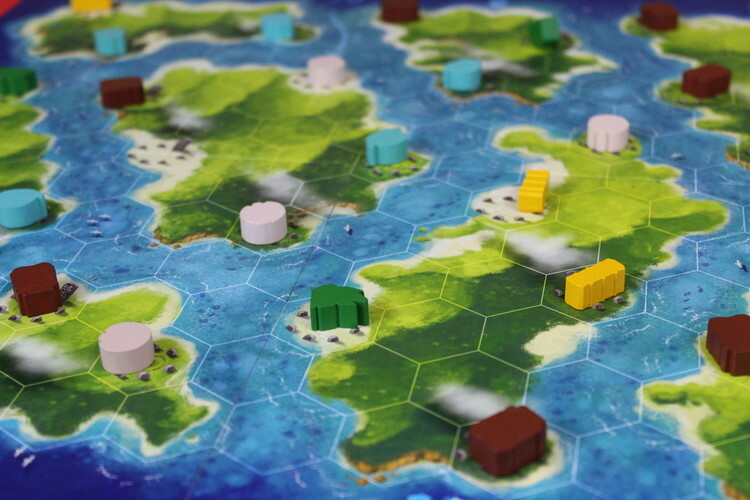 Players with pieces on all eight islands score twenty points, players with pieces on seven islands score ten points. 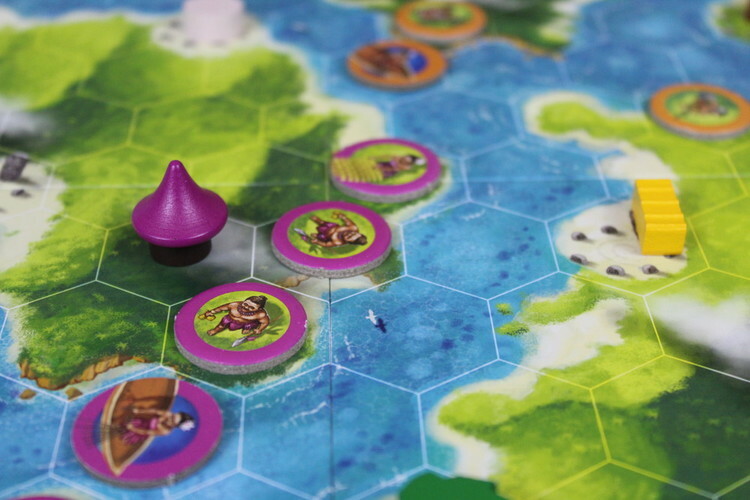 Players earn points from the chain of pieces that link the most islands. For each island linked by this one chain score five points. 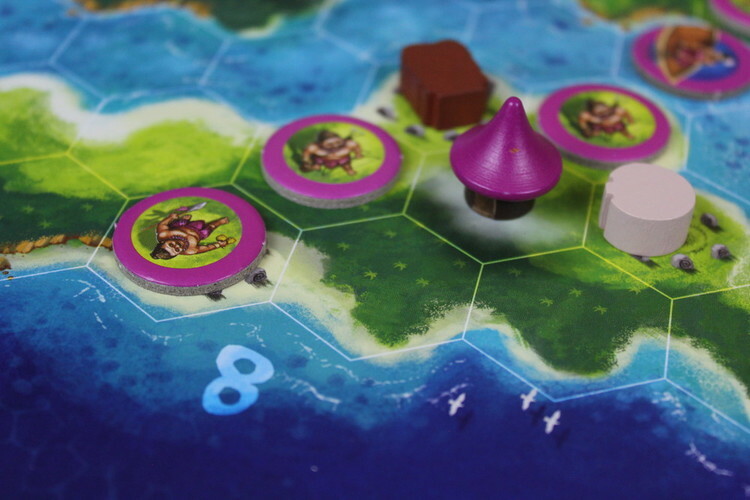 The player with the most pieces on each island score the points as indicated on the board. 6,8 or 10 points, in the case of a tie for control points are shared equally among players. Players score for matching resources, two of a kind score five points, three of a kind ten points and four or more scores twenty points. 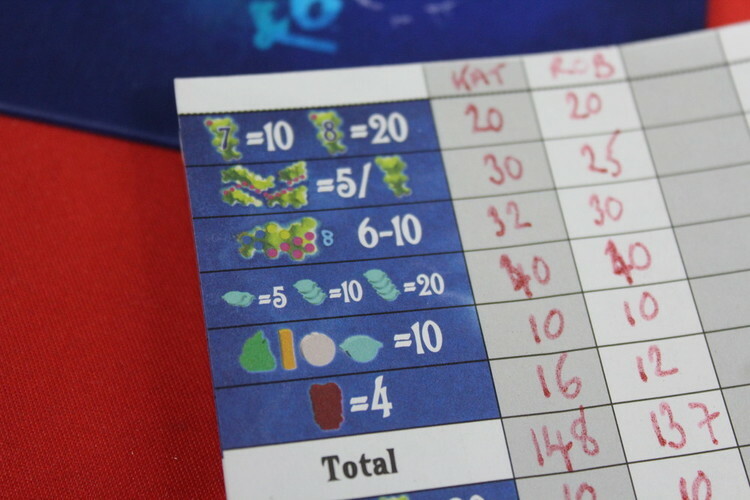 If a player succeeded in collecting all four different resources, they score an additional ten points. For each statuette players collected, they score four points. After the scores have been totalled up, remove all settlers (keep the villages on the board) and any remaining resources from the board. 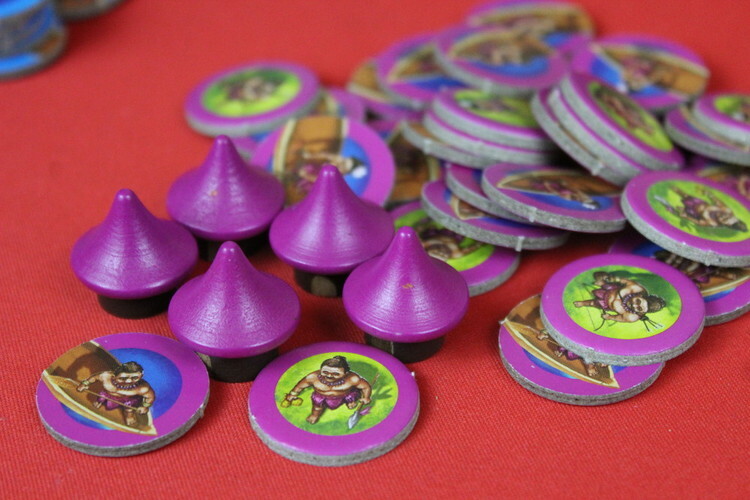 Drop all resources and statuettes back in the bag and repopulate the board as before. The player to the left of the player who took the last turn begins play. During the settlement phase, you may only place your piece onto an unoccupied space next to a space you are already occupying. Take resources and statuettes as before. Again, the round ends either when all resources are gone or all players have placed all their pieces. The score is recorded as before and the totals for the two rounds added up. The player with the most points wins. In the case of a tie, the player with the most resources and statuettes wins. As with many of Reiner Knizia's designs, this is a deceptive little game. Turns play super quick as you place a single piece. However, which victory points do you go for? Placing those villages in good locations are essential in the Exploration phase to give you a good start in the Settlement phase. We’ve played this at two and four player and it’s felt close at both player counts as it’s very easy to get cut off completely from part of the map. This then limits your bonuses for being on multiple islands and the joining islands bonus. This game is great, simple to play yet with multiple victory scoring and some tough decisions to be made. The settler chips are nice, sturdy cardboard with a dual sided design so when they are on land they go one face up and on sea, the other. They also have a variety of designs that just make it a bit more interesting to look at! A great game for beginners and gamers alike.